Remove the tops and stems from the bell peppers and clean out any seeds from the inside. Cut in half, removing any white parts, and then cut each half in half again. Set aside.Trim the ends from the squash and then cut in half lengthwise. If very thick, cut in quarters. Trim and peel the onion leaving the root end intact to hold the slices together. Cut in half, and then cut each half in quarters.Brush or drizzle all of the veggies with your favorite Extra Virgin Olive Oil* and season with salt and pepper.Grill vegetables for about 10 minutes, turning once until tender and slightly charred. 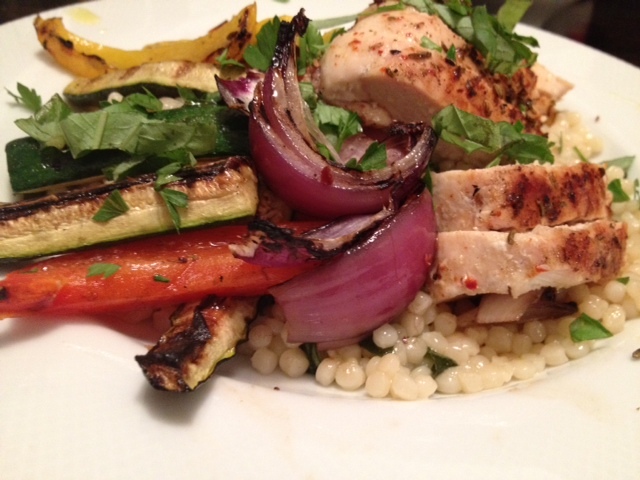 *I used We Olive Fresh Garlic Olive Oil to give the grilled veggies an extra boost of flavor. I finished the dish with We Olive Triple A Blend for it’s buttery flavor and peppery kick.